Our family can’t believe how much we love this option! 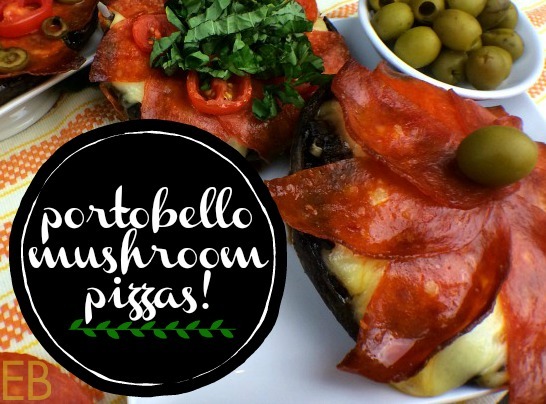 Portobello mushrooms provide the best base for a pizza. We like this option every bit as much as a bread-y take on the classic Italian treat. Add to that the benefits of eating such a healthy “crust!” This one’s paleo, GAPS, keto, low-carb, easy on blood sugar levels; yay! I spent years making different versions of stuffed button or crimini mushrooms, experimenting with how to dip or brush the mushroom before baking for the best results. (Dipping them in white wine before stuffing turned out to be my favorite option.) 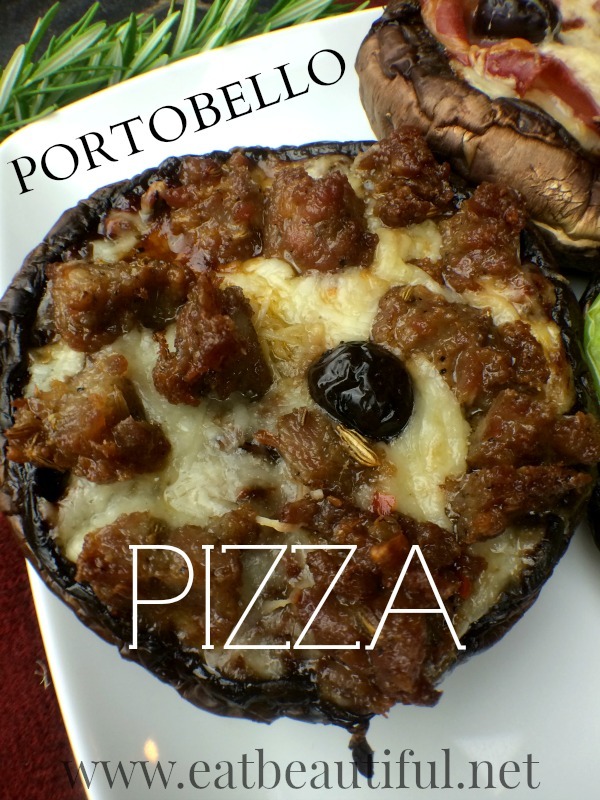 What I learned with baking portobello mushrooms is that they need no preparation at all. They are awesome just filled and baked. Thus, one of my favorite dinner adjectives comes into play: easy. Below you’ll see, too, my frugal (optional) use of the portobello stem, every bit as useful and tasty as the cap itself. We whip up a quick, flavorful and delicious tomato sauce using the mushroom stems. Finally, regarding topping options, see below all of my favorite suggestions. Sustainably-sourced pepperoni or sausages are equally good choices, as is prosciutto. I love raw, grated cheese on these; but I also give two dairy-free cheese alternatives that turn out great. Topping already baked pizzas with garden-fresh summer tomato and fresh herbs are finishing touches that make the pizzas special. But straight-up pepperoni and cheese can’t be beat either. I do not use mozzarella cheese, by the way. I do not like part-skim cheeses. I like fat. Jack is nice: it’s mild, creamy and melts well. Yet it has more flavor than mozzarella and less than cheddar. Other good options include fontina; Port Salut is my favorite choice (found at Trader Joe’s) and manchego. 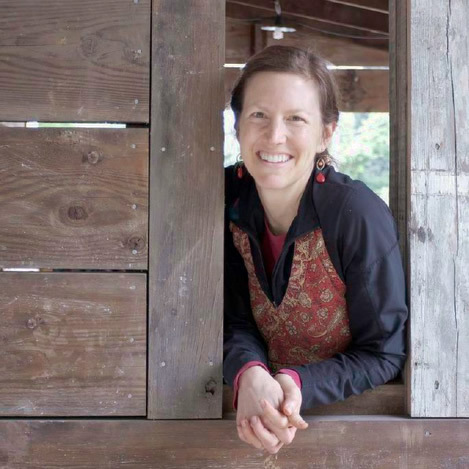 Organic Valley makes good jack cheese that is raw and grass-fed. I also love the cheeses produced by Kerrygold. They seem to be as allergy-friendly as French cheeses, which I’ve found to be the best overall. Preheat oven to 400 degrees Fahrenheit. Choose a large cast iron skillet (see link below) or baking pan that will fit the mushrooms. Wipe each mushroom with a wet dishrag or paper towel, to clean. Turn each mushroom over and pop out the big stem, pushing with your thumb to one side. Reserve the stem. Use a spoon to remove the gills in the underbelly, raking it along; they will scrape out easily. Reserve them. Chop the stem into small pieces. Heat fat in medium size pan. Add chopped stem and sea salt. Saute over medium-high heat for 8-10 minutes. Add gills, garlic and dried basil, reducing heat to medium-low. Saute for 2 additional minutes. Transfer sauteed mushroom to medium size bowl. Add tomato paste and stir well. Fill the cavity of each mushroom with tomato sauce. Place mushrooms into baking pan. Top with remaining preferred ingredients: grated cheese, meat of choice, olives. Reserve fresh tomato and fresh basil to put on after the pizzas are baked. Bake 25 minutes, or until cheese is well melted and pizzas looks sizzling and a bit crispy around the edges. Top with optional fresh tomato slices and fresh herbs. Bringing a meal to a friend that you want to be fresh and hot when served? Need a make-ahead meal that’s prepped in the morning and baked at night? Prep these beauties and then wait to bake them. Raw stuffed mushrooms can be placed in the fridge for several hours and then baked at dinner time! Can’t wait to enjoy your upcoming book! I’m sure it’ll be just fabulous. Your recipes are always very tasty! 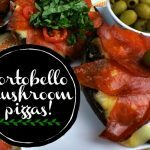 Portobello mushrooms are a favourite in my home. I’ve made similar stuffed offerings but your recipe ideas will vault my own to new heights!! Thanks for sharing your creativity. As you can guess, i will need to add a few more herbs… will let you know what happens! 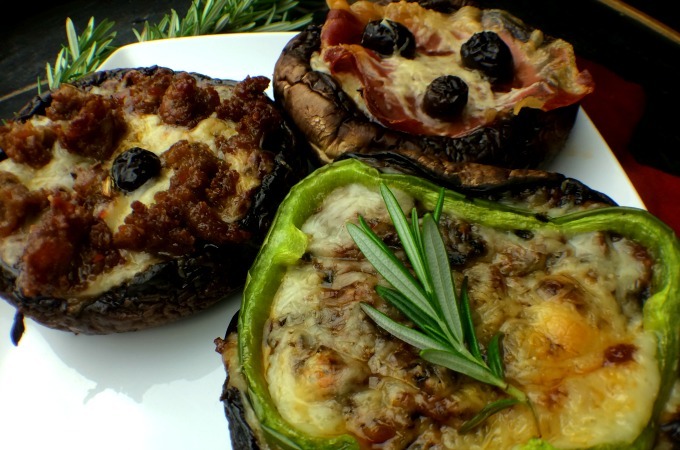 Thyme goes fab with mushrooms, as does Summer Savoury. Oregano. Lemon Balm, chopped finely with chives. Parsley, Garlic mustard…oh dear now I’m going down the wild foraging road.. more later!! I need to use lemon balm and garlic mustard!! Very fun. Thanks, Carol! These look amazing. I have been looking for a new pizza recipe. I have been making a Paleo pizza with tapioca starch, and while it is completely delicious and tastes exactly like wheat crust, it completely skyrockets my blood sugar. This looks way more blood sugar balancing and I love that it is really simple. I will definitely be sharing this with my pizza loving clients and making this myself, probably this week. I am also really excited about your new cookbook. Please keep us updated. This sounds so yummy! 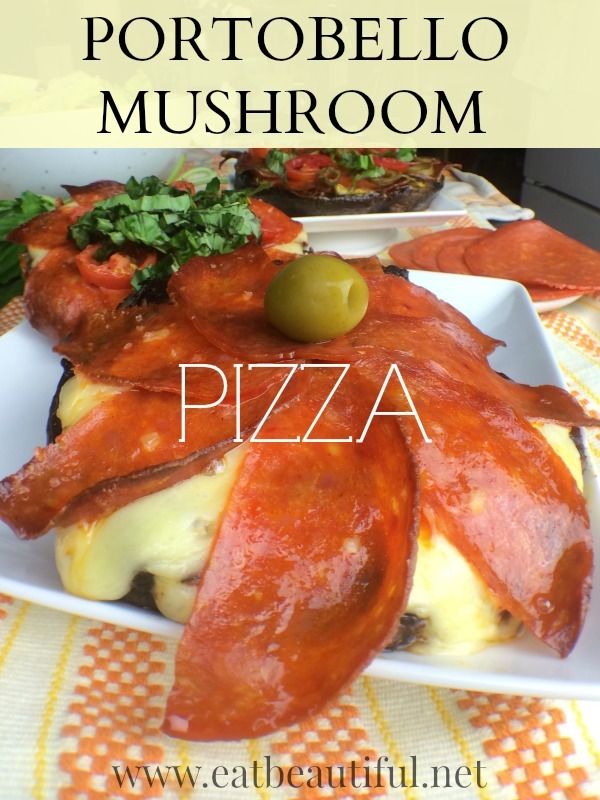 I love pizza, and I love mushrooms … what a lovely way to enjoy both! I want these now! I cannot find portobello mushrooms here, I might try a different type and make mini ones. They look so good! Yes! We did a few in crimini mushrooms and thought they’d be a fun appetizer. Lovely!! I’ll look forward to it! 🙂 Thanks, May! One of my favorite ways to make pizza these days! These look great! I’m a huge mushroom fan so any way I can eat more of them is good by me! Yes, Rachel, you said it exactly: those two things! 😉 Thanks!